How to watch Ladyhawke (1985) on Netflix Netherlands! Sorry, Ladyhawke is not available on Dutch Netflix. We check Netflix hundreds of times a day, so you can check back regularly to see when it appears for streaming. 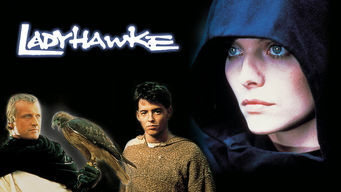 We'll keep checking Netflix Netherlands for Ladyhawke, and this page will be updated with any changes. A medieval thief befriends an exiled captain to defeat an evil bishop and reverse a curse purported to keep the captain and his love apart forever. Parted day and night, they can only be together at twilight. The power of love needs some help from a clever thief.